The dwarf geckos of Redonda, Sphaerodactylus sp, are among the rarest creatures on earth. About an inch long, on average, with translucent brown skin spotted white and bulging eyes, they can be found only on the one-mile stretch of mountainous island that Columbus mistakingly thought was round — hence his name for it: Santa María de la Redonda. Today, uninhabited Redonda in the Leeward Islands is part of Antigua and Barbuda, though it’s closer to St Kitts and Nevis. Researchers think the geckos meet the criteria to be on the list of critically endangered species. Their numbers were reduced by the destruction of their habitat by invasive species — rats and goats — brought to the island more than a century ago by humans. 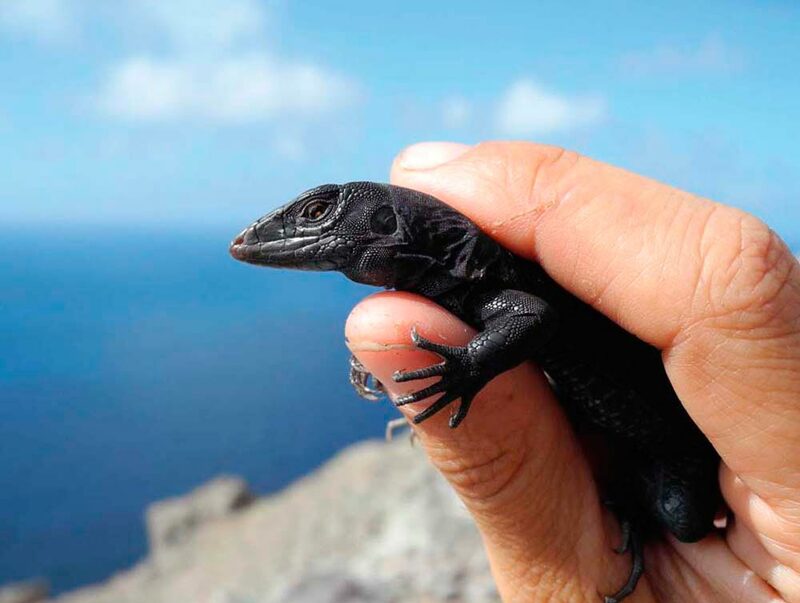 But now people are racing to reverse the damage and save the dwarf gecko and two other lizard species endemic to Redonda. A ground lizard, Ameiva atrata, long, glossy black, and described as fearlessly inquisitive by researchers, is listed as critically endangered. And a tree lizard, Anolis nubilis, which has few trees left to climb and actually lives mainly between the rocks of the almost barren island, is for the time being listed as stable. 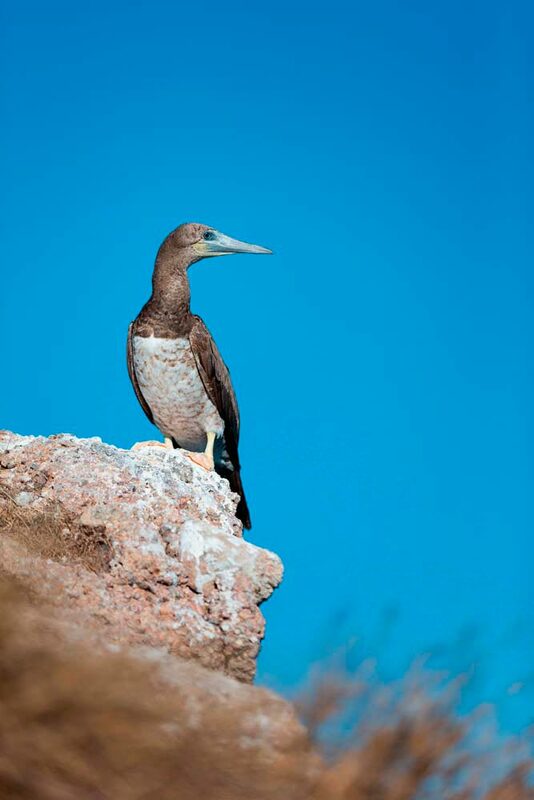 Redonda is also the nesting place for hundreds of seabirds. According to a 2012 survey, more than fifty per cent of masked boobies — the largest booby species, distinguished by a dark grey face that contrasts with a mostly white body — in the Lesser Antilles nest on Redonda. And more than twenty per cent of the breeding pairs of the region’s brown boobies — large, long-billed birds with a white, feathered bib extending from chest to belly — use Redonda, along with twelve per cent of magnificent frigate birds. Daltry works for UK-based Fauna and Flora International. The oldest global conservation organisation, FFI has restored twenty-four islands in the Caribbean, including protectorates of Barbados, St Lucia, and Anguilla. Daltry first came to Antigua and Barbuda in 1995, to help save the Antiguan racer, a venomless snake endemic to the country that was on the brink of extinction. Only about fifty remained on uninhabited Great Bird Island. The Antiguan Racer Project proved successful, and grew into the Offshore Islands Conservation Programme, which worked to save the wildlife and vegetation on fifteen islands in the Antigua and Barbuda chain. The Caribbean region has one of the highest rates of species extinction, Daltry pointed out in a 2015 presentation. She traces the problem back to when Europeans first came to the region. Rats stowed away on ships. Goats were brought to Redonda to provide meat and milk for miners who lived there between 1860 and the First World War, extracting guano. Elsewhere in the region, mongooses were brought from Asia to deal with the rats, but turned into pests themselves. Invasive species are also a problem in inhabited areas, but uninhabited islands promise long-term success in providing a safe haven for wildlife. “What is exciting about some of those little offshore islands is that you can actually turn back the clock and help wildlife recover,” says Daltry. When researchers visited Redonda in 2012 to do a feasibility study, they estimated a rat population of around 5,500. Individual rats live only about a year, but they reproduce relentlessly. In the stomachs of rat specimens, researchers found plant, bird, egg, and lizard remains. Demonstrating the extent to which rats consume anything in their path, they were also found to have ingested goat droppings — and other rats. If rats caught in traps weren’t retrieved quickly enough, researchers would find them partially eaten. The intricate rat eradication process was laid out in the 2012 feasibility report. Fund-raising took years. The mission, which cost an estimated US$700,000, brought together an impressive coalition, including Antigua and Barbuda government agencies, the local conservation NGO Environmental Awareness Group, Caribbean Helicopters Ltd — helicopters are the only way to access Redonda — and the British Mountaineering Council, who helped lay rat poison around the island’s steep cliffs. UK charities the Darwin Initiative, the National Fish and Wildlife Foundation, and the Taurus Foundation provided funding. The rat eradication began in January 2017 and was wrapped up by March. Around the same time, the sixty-five or so goats on the island, who were starving because of a lack of vegetation they helped decimate, were corralled and carefully airlifted to the mainland. It will be months before Redonda can be declared rat-free. The island has to be regularly monitored over the next few years to make sure the rats are gone and to see how the wildlife and vegetation rebound. Public education is an important part of maintaining the restored islands, says Daltry. “When I first went to Antigua I spoke to a school class, and I said, ‘Where do wildlife live?’ And they said, ‘Oh, in Africa.’ Because they’d only seen naturalistic programmes about Africa and the lions and elephants,” she says.